BAJA CALIFORNIA (Dan Trimmer) Tetraploid (Sdlg. X Spanish Fiesta) 36" EM Re. Ev. 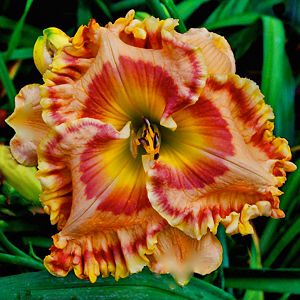 7" This orange, pink blend with the big rouge eye and double edge has been a star since its first bloom. Aside from the striking bloom it is BAJA CALIFORNIA’S plant habit that has me so satisfied. Typical bud count on 36" tall, well branched scapes is typically about 50 buds per scape that re bloom very well here in Florida. Three well branched laterals each carry the multiple blooms very nicely about the arched foliage. Easily fertile, I used BAJA CALIFORNIA a great deal as a pod parent this year. This is my most circular, wide sepaled, sophisticated orange based introduction to date, and will again be used in my orange hybridizing program next year.